The Pebble Beach Concours d’Elegance 2010 was held Sunday, August 15th at the Pebble Beach Golf Links in Pebble Beach, California. More than 250 cars and motorcycles lined the 18th hole of Pebble Beach Golf Links for the 60th annual Pebble Beach Concours d’Elegance, with a total of 29 classes in 2010 including feature and special classes. 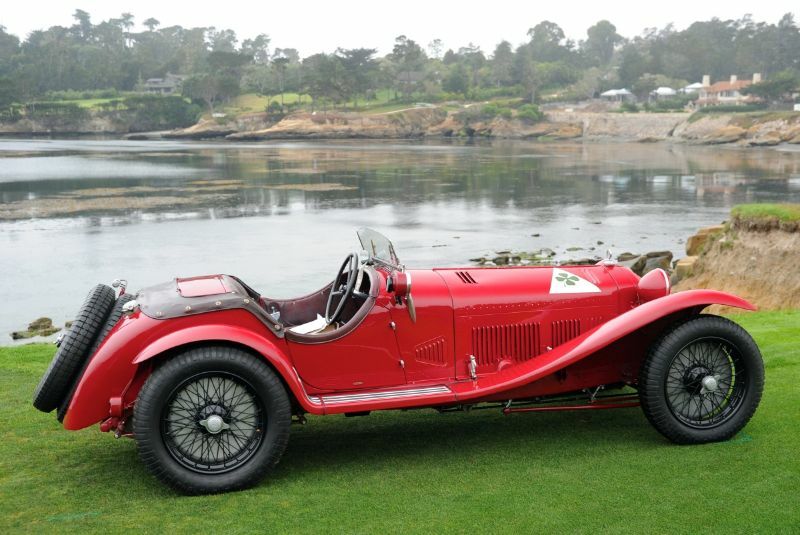 Alfa Romeo, a featured marque at the 2010 Pebble Beach Concours d’Elegance, had the largest presence on the show field, including seven vehicles shipped from the Alfa Romeo Museum in Arese, Italy. The 75th anniversary of Jaguar was also featured, as was Pierce-Arrow. Special classes included a focus on the 50th anniversary of the Ferrari 250 GT SWB Berlinetta, the centennial of the Indianapolis 500, Hot Rod lakesters and Bonneville racers, American Prewar Road and Ghia-designed vehicles. Following the initial appearance of a motorcycle class last year, the 2010 class showcased Pre-war American road and racing motorcycles, including board-track racers. The overall winner – Best of Show – was a 1933 Delage D8S Roadster with coachwork by DeVillars owned by the Patterson Collection. (See Delage D8S DeVillars Profile). Also nominated for Best of Show was the 1939 Delage D8 120 Henri Chapron Cabriolet of Daniel Sielecki, Sam and Emily Mann’s 1930 Duesenberg J Graber Cabriolet and the 1929 Bentley Speed Six Park Ward Open Two Seater of Arturo & Deborah Keller. In the first of several photo galleries dedicated to the 2010 Pebble Beach Concours d’Elegance, Tim Scott of Fluid Images offers the following 160 spectacular images from the 18th fairway at the Pebble Beach Golf Links. To see more of Tim’s images, visit fluidimages.co.uk. Nicely done coverage guys! Superb show. I realize this is a Sports car publication, but I feel that the early motorcycles should at least deserve some recognition. After all, this is the only the 2nd time they have ever been accepted at Pebble, and they were a huge crowd favorite. Great coverage otherwise. Fair enough. Pebble is a mad scramble to get decent pictures of the 200+ cars before the crowds arrive. When finished, we then headed to the motorcycles and they were swamped with people, especially when Jay Leno was there. The images were not presentable enough to publish. I did not see any photographs of the class winning Alfa-Romeo owned by Patrick Ottis. I did not see any photographs of the other class winning cars restored by his firm. We are following up with an Alfa Romeo-focused story that will have the Ottis 8C 2300 Figoni Cabriolet. Beautiful piece. Photo #3 seems to be mislabeled as a 1913 American Underslung Traveler Type 56 7 Passenger Touring. It looks like a later car with conventional springs. Seven people would be a tight fit. And if I’m wrong on all of that, it certainly isn’t a touring car. I’m guessing a Pierce Arrow coupe from around 1923. Some nice ones, few nicer than my aluminum and mahogany boat-tailed speedster! The red Pierce-Arrow is a 1909 48 hp 7 passenger touring owned by: Lynette and Vaughn Vartanian. You have it posted as a 1915 66hp owned by John Mozart. Hi Vaughn – thanks for the correction. We’ve updated those two pictures. Beautiful Pierce-Arrow.